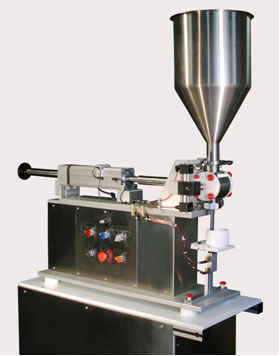 PF8 Tabletop Piston Filler for accurate filling of heavy creams and pastes (non free-flowing) products. 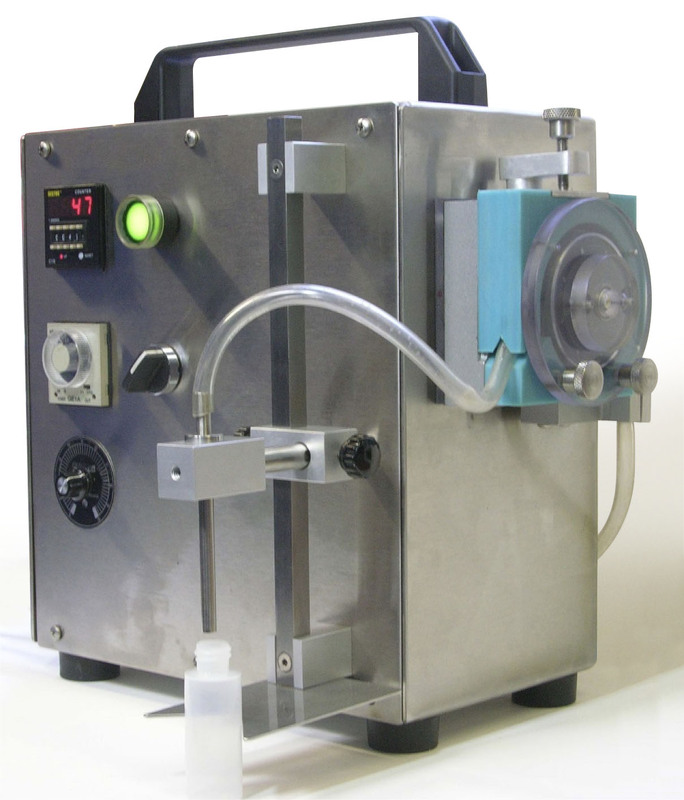 This volumetric filler is air actuated and has a programmable control system that allows the filler to be run manually or automatically, easily integrating with other packaging equipment. Filling capacity, single stroke 1/4 oz to 8oz. Other filling capacity pistons are available. FLEXOPUMP-1 is a table top heavy duty filler. This filler has a ½ HP motor. Fill from 10 ml up to 4 liter with an accuracy better than .25% of fill volume. The filler rollers are mounted on sealed pre-lubricated bearing for a long life. The machine comes with a foot pedal and can easily be integrated with a conveyor or indexing table for fully automatic run. Various tubing materials can be used with the filler (1/8 to 3/8 OD). The filler includes a 1/2 hp variable speed drive, precision fill volume encoder, dial up volume control, and recycle time for continuous filling. Foot switch operated. Positive shut off nozzle. 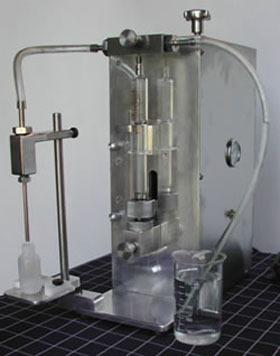 The filler is suited for filling salad dressing, creams, lotions and gels. The machine has a 30L hopper. The lobe pump can handle some chunky products. This filler includes a 1/4 hp variable speed drive, precision fill volume encoder, dial up volume control, and recycle time for continuous filling. Foot switch operated. Positive shut off nozzle. 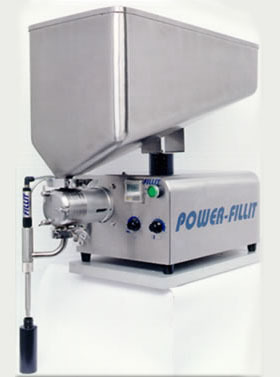 The filler is suited for filling water, wine, shampoo, oils, sauces, syrups, etc. The product is kept in motion all the time to prevent separation of the product. The filling is done in two steps. First the liquid fills a chamber where a sensor detects the level. After the level is reached the liquid is discharged into the vials. 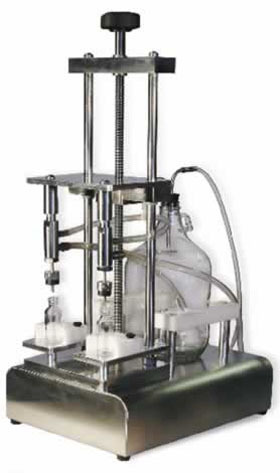 The filler is designed for medium volume production in the cosmetic industry. 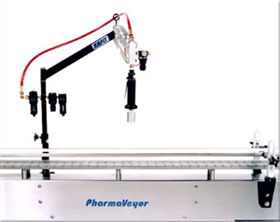 The Kapit bench top semiautomatic cap torquer is ideally suited for small production runs, lab/research areas, and other low production situations. By simply clamping the torquer to any existing conveyor or work station, the torquer may be used as a capper, re-torquer or cap removal. Microfill-20 is an accurate filler for Milliliter volumes - Filling vials, small bottles, dosing active ingredients or flavors, etc., and can handle low viscosity liquids such as (water, oil, alcohol etc.). The machine is air actuated making is suitable for explosion proof filling. All product contact parts are stainless steel, FDA approved plastic or glass. The dispenser is a glass with graduation in Milliliters. The control mechanism allows for setting the fill volume to a high accuracy. Depending on the fill volume the speed is between 14 to 24 containers per minute. All parts in contact with the product can be easily disassembled for cleaning. 0 to 10ML, 0 to 20 ML and 0 to 50 ML. For larger dispensing volume we have the Microfiller-100 which can fill volumes from 0 to 100 ML and 0 to 200ml. Ideal for filling nail polish, nail polish remover, perfumes and alcohol-based or volatile liquids. The new AE Vacuum Filler is a semi-automatic, completely pneumatic system designed for safe packaging of any flammable free-flowing product. The AE Vacuum Filler also simplifies the filling of narrow long necked bottles by creating a vacuum effect, which draws the product from your storage tank into the bottle. After reaching the correct level, excess product is drawn into the integrated vacuum chamber for recycling. With its dual nozzle design, the AE Vacuum Filler enables you to fill two bottles simultaneously, translating into faster production speeds. 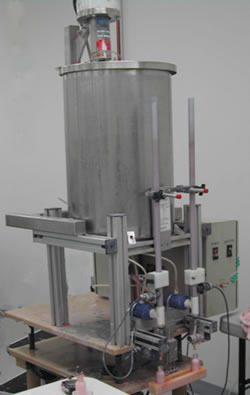 The AE Vacuum Filler is built on a stainless steel base and all product contact components are made of non-corrosive materials. 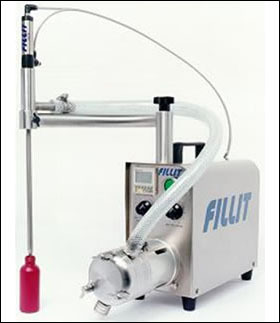 All pneumatic, this filler requires only compressed air (60 psi/6 cfm). Copyright ©2011-2019 Applied Engineering Corporation. All Rights Reserved.